Time for a new fitness challenge! 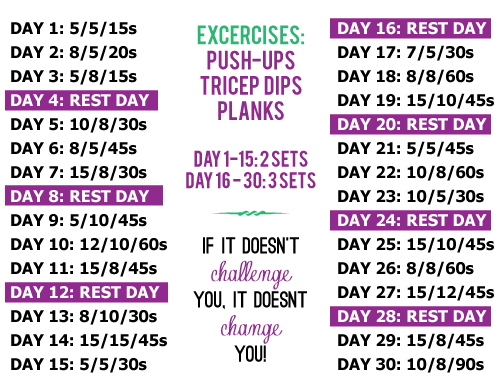 The 31 day arm challenge has 3 different exercises which you have to do each day, and the time spent doing the exercise slowly increases day by day to help you build up your core body muscle strength gradually, ensuring you are able to complete the final day of the challenge easily. The 31 day arm challenge will also help work your upper body and improve your strength. By completing this arm challenge you will notice a significant difference! This challenge ends on August 31st! Click here for the workout calendar.